Pittsburgh Pirates relief pitcher Ryan Reid (43) delivers a pitch against the Milwaukee Brewers after the eighth inning at PNC Park on Jun 28, 2013. The Pirates won 10-3. 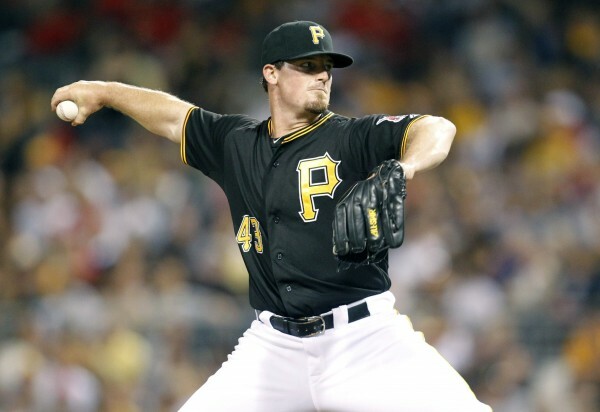 PITTSBURGH — Ryan Reid of Portland has persevered to reach the major leagues. The right-handed relief pitcher has earned a spot in the bullpen for the surprising Pittsburgh Pirates, who lead the National League Central Division. The 28-year-old Reid has survived a stress fracture in his elbow that threatened his career in 2009. He made 286 minor league appearances before making his major league debut last month. Reid, who was a seventh-round draft pick of Tampa Bay in 2006 after his junior year at James Madison University (Va.), is glad the Rays didn’t give up on him. Reid said his one-seamer, at 92-93 mph, has become a key pitch for him. It has downward movement and induces a lot of ground-ball outs. He also relies heavily on his 84-88 mph slider, which he calls his strikeout pitch. A four-seam fastball and a changeup complete his repertoire. He put together a solid 2012 season with AAA Durham (6-3, 3.52 earned run average, 79 strikeouts in 79⅓ innings). Reid then returned to Venezuela last winter and had another valuable experience. He became a free agent and the Pirates signed him to a minor league contract and invited him to major league spring training. Reid had a remarkable stint in AAA Indianapolis this season, leading to his call-up to the Pirates on June 2. In 20 relief appearances, he had a miniscule 0.52 ERA and a 6-1 record. He struck out 31 and walked nine in 34⅔ innings. Reid made his major league debut on June 3 with a scoreless 1⅓-inning stint against Atlanta. Entering Wednesday’s game, Reid had allowed only seven hits and one earned run in nine innings in six appearances for the Pirates. He had six strikeouts, two walks and limited hitters to a .212 average. He has a save. “Ryan showed us what he was capable of doing right from the start of spring training,” said Pirates pitching coach Ray Searage. “His strong showing in the spring carried over to the start he had at Triple-A and he didn’t miss a beat since we called him up in early June. Reid has evolved throughout his various ordeals. He had been a starting pitcher throughout his high school, American Legion and college career. He was chosen to the all-tournament team at the 2004 American Legion World Series when Nova Seafood claimed the national championship. His 29 strikeouts earned him the Bob Feller Pitching Award. After struggling mightily (1-9, 6.24 ERA) as a starter in his first pro season with Class A Hudson Valley, he was moved to the bullpen. Reid said he is much better suited for the bullpen. “I throw with everything I have on every pitch. That doesn’t translate into a seven- to nine-inning pitcher. And I’m only 5-[foot]-11. I work downhill with every pitch. The ball comes from behind my head. It all correlates into [being more successful as] a reliever,” said Reid. He described pitching in the big leagues as a chess match that is determined by pitch location and selection. “You have to commit to every pitch and to a spot. You have to be aware of everything as the game goes along,” said Reid, who watches tendencies from the bullpen and studies reports on hitters. Reid loves being with the Pirates, who he said have a collective blue-collar attitude. He thoroughly enjoys manager Clint Hurdle, Searage and all the coaches and said the crowds have been outstanding. Despite the challenges, he said he wouldn’t change anything about his pro career. “I wouldn’t be here without everything that happened. I take everything with a grain of salt, one day at a time. I know I can be successful up here and help the team win,” said Reid.